Have you ever seen a picture or heard a story and thought, “I have to do that!”, without really knowing what you’re getting yourself into? My Lonely Plant guide to South East Asia lists climbing Mt Kinabalu as one of the top experiences in the region. The phrase is something like, “forget about the cost, the pain in your legs, and the price of a beer at Laban Rata – it’s absolutely worth it.” I don’t know why, but based on nothing more than that, I decided I was going to climb Mt Kinabalu. I booked in some leave at work, started thinking about the rest of my trip’s itinerary, found some flights, then did some research about what I would actually have to do. Turns out it’s a lot more involved than I realised. Mt Kinabalu is in Sabah in Malaysian Borneo. It’s sometimes said to be the highest mountain in South East Asia. It’s not, but it is pretty damn big, towering over everything else in the neighbourhood at 4095m above sea level (that’s 13,435 ft for those of you who speak Imperial…). The route to the top is 8.72km, which doesn’t sound that far, but nearly every step is vertical. It’s known for being a difficult climb. The rapid ascension makes altitude sickness a real problem for a lot of people, and plenty of climbers don’t make it to the top – even very fit people, weirdly enough, because they often ascend too quickly and the altitude messes with them. The typical way to climb the mountain is in two stages. On day one, you climb from Timpohon Gate near the National Park HQ to Laban Rata, a collection of guesthouses (not even really a settlement) perched on the side of the mountain about 3270 metres (10700 ft) up and 6km along the trail. You stay the night, doing your best to get accustomed to the height and enjoying the scenery, then get up for a pitch black 2:30am start to complete the rest of the climb before sunrise. If the weather cooperates, your reward is a gorgeous orange sunrise from the highest point in Borneo, and you can watch the jungle come to life below you, feeling like some ancient god. Then there’s the descent. 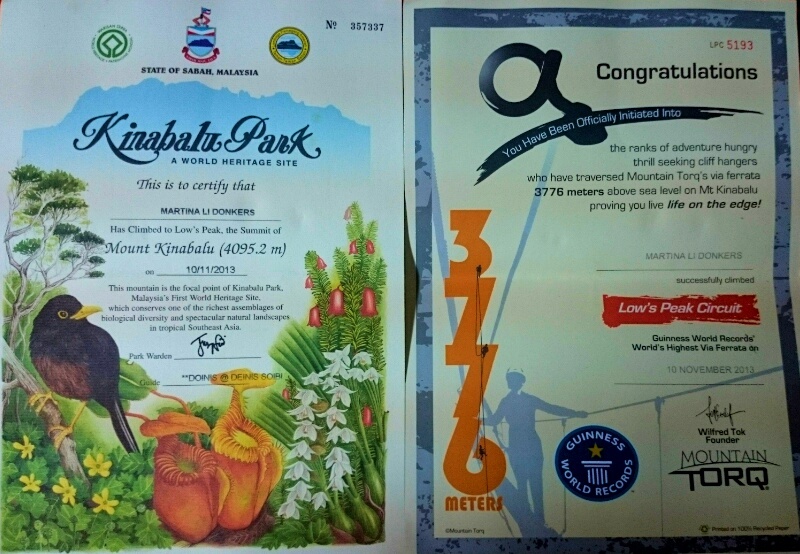 99.5% of people who climb Kinabalu go back down the way they came, but there are actually some other options. For one, you can climb down the sheer rock face on the Via Ferrata trail. Via Ferrata is kind of like outdoor indoor rock climbing. There are artificial pegs and a set route that you follow, but you’re outside clinging to the side of a mountain. 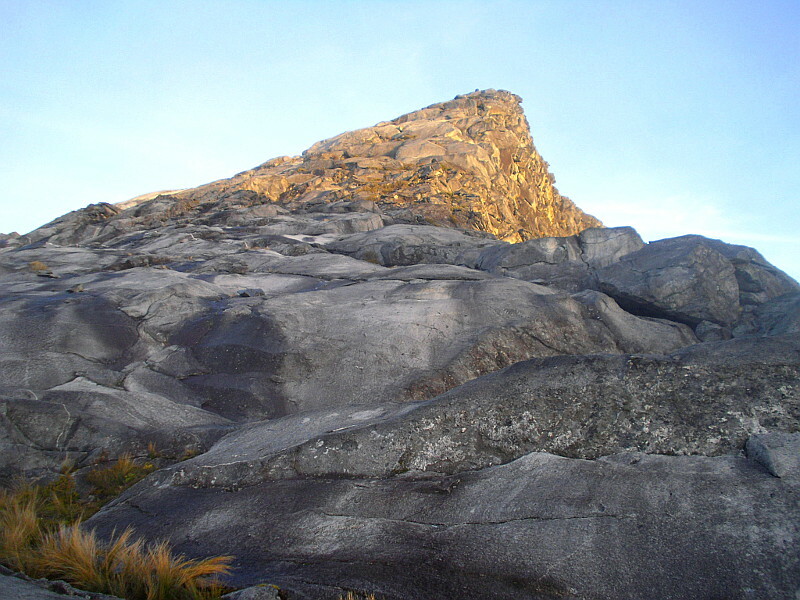 The Mt Kinabalu Via Ferrata is the highest course in the world. That will get you part of the way back down to Laban Rata. For the rest of the descent, you can continue back down Timpohon trail, or you can take the Mesilau trail which breaks off to the left at about the 5km marker. It’s longer and even steeper, but it takes you through rarely visited jungle and you might even see wildlife as well as incredible plants like pitcher plants. It’s meant to be hard work though. The general consensus is that despite how steep it is, more or less anyone of average fitness can do the climb, as long as you’re determined. And let’s face it, I’ve been called stubborn pretty often. Flying out of Kota Kinabalu a few days later, I caught a glimpse of the mountain through the misty clouds. I mentally gave myself another pat on the back – it didn’t look so big from up here! Then I realised I wasn’t looking down at the mountain – it was further back, and still above us! Just like that moment in the Simpsons when Homer first spies the Murderhorn… I had to laugh. I made my bookings online from home in Australia, deciding that I would do both the Via Ferrata and the descent via Mesilau, because they sounded awesome. Because of this, I also decided to book two nights at Laban Rata rather than the usual one night, to allow m to take my time a bit more if I needed to. And before I knew it, I was flying into Kota Kinabalu! Kota Kinabalu is a relaxed sea-side town and the capital of Sabah, Malaysia. I spent my first day wandering around and getting acquainted, seeing what was about. It’s one of those amazing tropical places where even the weeds are beautiful, dripping with huge tropical flowers. I love that when I first got off the bus with my big backpack and a slightly dazed expression, a woman walking past came up to me and said “Welcome to Sabah!” then continued on her way. Ok, I decided. I like it here. 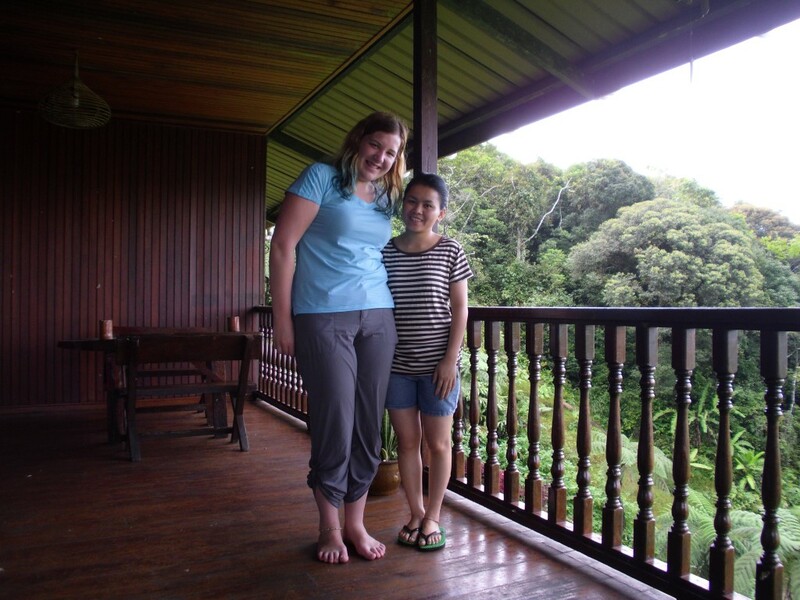 I had booked myself into Kinabalu Mountain Lodge for the night, which is just a few ks from the National Park and around two hours from the centre of town, so in the afternoon, I found the shared taxi stand and boarded a mini bus heading in that direction. The winding road was misty and busy, and before I knew it, I was standing at the turn off to the guesthouse. It was mizzling by then (you know – more than a mist but not quite a drizzle…), and I donned my rain coat and probably should have put on my sneakers. I didn’t though, and nearly slipped over in my went thongs/flip-flops half a dozes times on the steep bits of the track. I made it to the lodge unscathed, which is a lovely wooden building set in lush rainforest. 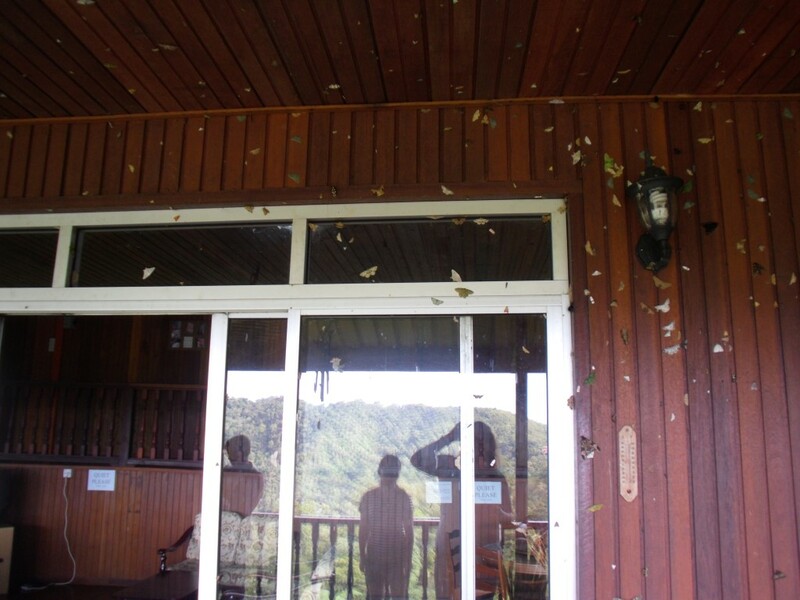 They specify on the booking page that this is a place for nature-lovers – what they mean is, they can’t do anything about the volume of insects so please just deal with it! I’ve never seen so many different coloured moths in my life (ok, maybe in a museum but still…). Luckily I’m fine with insects, so it wasn’t a problem for me. The only issue was that it was a bit cold overnight, and I had to filch some extra blankets from some unoccupied beds in the dorm. They really should invest in some more. 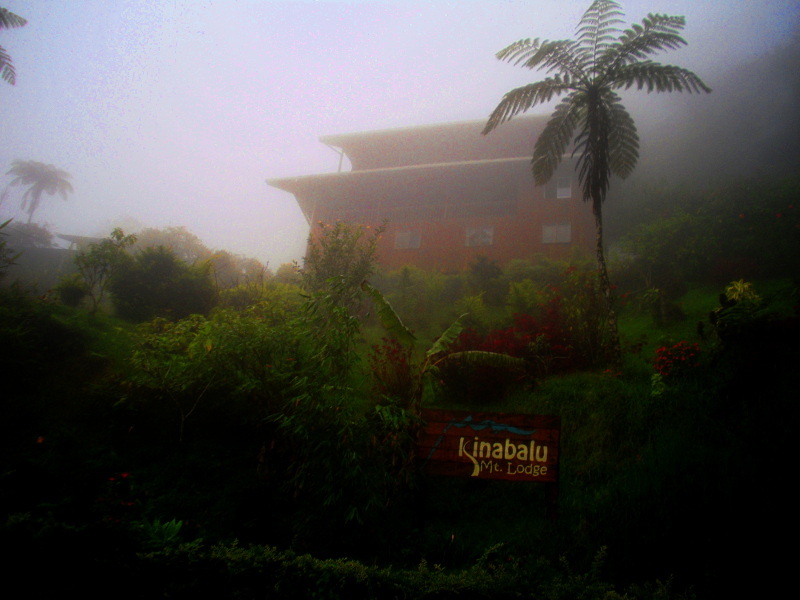 Kinabalu Mountain Lodge looming out of the mizzle. 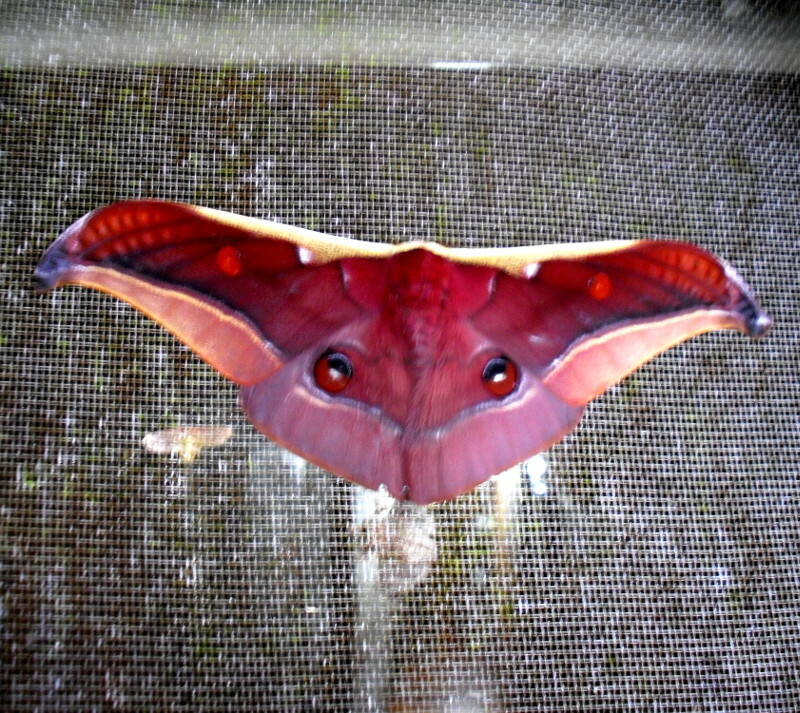 This impressive looking moth was on the door to the dorm rooms. 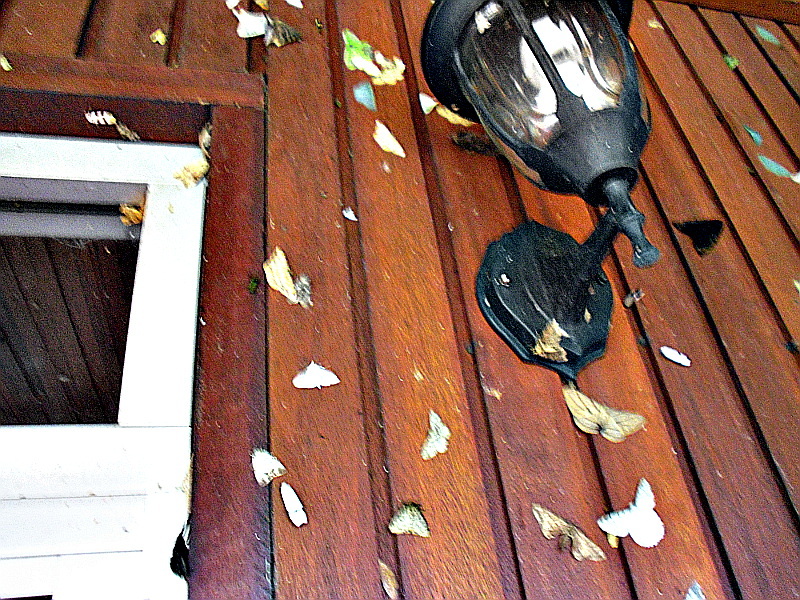 There really were a LOT of moths! The following day was bright and sunny, with just a few puffy clouds. I said goodbye to my hosts (who had been shy and reserved but insisted on a picture at the end!) and took a taxi to National Park HQ. There I met my guide, Dennis. We put my big bag in storage, finalised the paperwork (there’s a lot), took the bus to Timpohon Gate, and then we were off! The first part of the climb, teasingly enough, is actually downhill for a few hundred metres, landing you at the picturesque Carson Falls. From there, the actual climb begins, reasonably gentle at first, but ever increasingly steeper. You don’t get to experience downhill again for a long, long time. There’s a big variety of people on the mountain. Solo travellers like me and people in pairs and small groups, big groups with matching tshirts on corporate team building trips out of Kuala Lumpur, super-fit types striding past everyone and people who seem to have been dragged along by their friends or family already pausing for breath after every few steps. The porters race past everyone else – the only way to Laban Rata is by walking or helicopter, so all the supplies are carried up by wiry looking locals balancing huge loads. And there’s a wonderful camaraderie to it all. We’re all here for the same reason. We’ve all had friends at home tell us we’re crazy for wanting to do this, and we’re all just so excited to see the top. As we start to pass people on their way down, they wish us good luck, calling out “it’s worth it!” and “you can do it!” The guides and the porters joke with each other at every opportunity. The atmosphere is positive and bubbly. Dennis is an excellent guide. He’s been guiding people up the mountain since he was 13 – that was 43 years ago! And in that time, he’s seen it all. He told me all sorts of stories about the mountain and the landscape. Yes, he said, he’s even had to carry people down who died suddenly of altitude sickness. The worst one, he said, was a couple on their honeymoon. She didn’t want to complain and so didn’t say anything about how sick she was feeling, and then it was too late. It was an important reminder – altitude sickness can be really serious, and it’s important to monitor how you’re feeling at all times. Slow down, he would remind me when my excitement got the better on me during the first few ks. It’s more important to pace yourself. The first few kilometres are humid, and the steamy jungle is dense around you. There are markers every 0.5km so you know exactly how far you’ve come – and far you have to go. As you get higher, the landscape opens up. Tall trees are replaced by scrubby bushes, bare rocks, and drier plants. We stopped for lunch at about 12 at the 4km marker – they provide cheese sandwiches, bananas and boiled eggs, basic but energising. It’s around here that the views down to the surrounding hills start to get excellent, as even now you’re way above the surrounding peaks. First distance marker! These are positioned every 0.5km along the trail, so you always know how far you’ve come. From the 5km marker things started to get trickier. At this point you’re already above 3000m (9800ft), well above the 2600m threshold where altitude can become an issue (and well above the highest point in my entire home country). The atmosphere gets thinner, and breathing starts to feel like it’s not working quite the way it should. The frustrating thing was I just felt like I couldn’t get enough air into my lungs. I honestly wasn’t really struggling with the slope and my muscles weren’t very tired, but I started having to stop for regular breathers in an attempt to catch my breath. I persisted though – after all, it was only one more kilometre to Laban Rata. Dennis was pretty keen for us to hurry up at this point too – he could tell the rain was coming, and wanted to be inside by the time it fell! Look how high I’ve climbed! Finally made it to Laban Rata! That’s Pendant Hut behind me. We made it by about 2pm, half an hour before the rain – yes! I checked into Pendant Hut, which is run by the Via Ferrata guys, and spent the rest of the afternoon relaxing, reading, and sitting by the window watching the endlessly fast changing clouds surrounding us. Dinner was at six, a big buffet in the main guesthouse, and then it was back to my mountain dorm (up a ladder no less) and into my sleeping bag for a very early night. Seriously, I took these pics within a few minutes of each other! Ok, so here is where things got really hard. I couldn’t sleep. Like, at all. I was very restless, but I knew I needed to sleep for the next day. But I just kept tossing and turning. My chest hurt, and my heart was racing. I tried to breathe slowly and meditate to bring it down, but I couldn’t. I checked my heart rate with an app on my phone – my average resting heart rate at the time was 62, but lying down in bed that night it was 105, and I couldn’t slow it down. I was worried. I was clearly feeling the effects of the altitude. And without a wink of sleep, how would I get to the top of the mountain? At 2am I got up and got ready as planned, but I was worried. Dennis arrived at about 20 past, and I told him I hadn’t slept, and that my heart was racing. Was I nauseated? he asked. No. How about a headache? No. He told me he thought I’d be fine. He said it’s normal to be unable to sleep the first night at high altitude, and it’s not unusual for your hear to race. Nausea and a headache were signs that things were getting serious, but without those symptoms, he said I’d be fine. So with that, off we headed into the night, following the bobbing trail of headlights up into the mountain. The first 500m out of Laban Rata were the hardest of the whole trek. It was cold, wet and slippery, crowded with people all leaving at the same time and too narrow to pass the slow movers or to have the fast guys get around you. My gloves were soon soaked through from gripping the hand rail, and I still couldn’t catch my breath. My heart was racing, feeling like it was basically in my throat. I was remembering all the stories about people who had suddenly dropped dead at this point, and suddenly I couldn’t go on. I sat down on a rock, nearly in tears, and told Dennis I couldn’t do it. He sat down beside me as other people pushed on past, and told me it would all be ok. Again he asked me, are you nauseated? Do you have a headache? No, and no. He reassured me it was normal to find it hard at this point, to be struggling to breathe. But he told me he was sure I could do it. This is a guy who has been leading people up the mountain for nearly twice as long as I’ve been alive. I put my faith in him, stood up, and kept going. Right then, the trail changed. The steep wooden stairs were replaced by sheer rock faces and a thick white rope which you had to hold on to and pull yourself up in some places. There was some actual climbing involved, scrambling at the rock face with hands and feet and balancing over sheer drop offs. It was technically much harder, but you know what? It was actually so much easier to me. The climbing stopped being monotonous and started being really fun. I was forced to go much slower which made it easier to breathe, and thinking about where to put my hands and feet distracted me from my racing heart. The pack of people had spread out by this point and I could easily go at a pace that worked for me. Ok, I thought. I can do this. We passed the final checkpoint and stopped for a drink. Dennis had another cigarette – did I mention he smoked the whole way?? AND he did the climb in flip-flops!! – and then it was on to the moonscape at the top of the mountain. An endless grey plane with the thick white rope stretching out to infinity in the darkness in front of you to mark the way, and all you can do is keep putting one foot in front of the other. Kinabalu is a multi-peaked mountain, and the lesser peaks started looming out of the darkness towards us. We could see the lights of Kota Kinabalu on the edge of the horizon, stretching out from the ocean like half a sunburst, and a dozen smaller villages dotted throughout the hills. The stars sparkled above us. And finally, looming out of the darkness, there was Low’s Peak, the top of the mountain. I passed the 8.5km marker. Only 220m to go, I thought. I can do this. It was the hardest 220m of my life. By that point, there’s no clearly defined path anymore. It’s just a scramble up a pile of boulders in whatever way you can. I had to pause after every rock I crested in a fruitless attempt to catch my breath. And then suddenly, almost unbelievably, I was there. Proof. Me with the sign at the top of Mt Kinabalu. The view was incredible. The handful of rubbish photos I snapped don’t come close to doing it justice. The sunrise was an orange fire just below the horizon, gradually bathing everything in glorious sunlight. The steep drop off in front of us was filled with shadows, stretching off into the unknown, while the lesser peaks around us became gilded in the morning light. It. Was. A. Mazing. It was also freezing cold. There was a biting wind, and everything was wet. The cold wind hitting wet gloves was the worst, and I was so glad I’d decided to wear thermal underwear (the kind designed for skiing). If it wasn’t for the cold, I probably would have stayed up there much longer, but as it was, I was keen to get out of the wind, so once it was light, we headed back down again. Descending was an incredible feeling. Everyone was wearing big grins and marvelling at the landscape around us. A handful of stragglers were still heading towards the top, and we encouraged them onwards in the morning light. The view from the top… determined hikers climbing Mt Kinabalu in the very last stages. The landscape is just surreal, unlike anywhere else I’ve been. Me at the 8km marker feeling cold, tired, and on top of the world. The walk down is much easier than the climb up Kinabalu! But my morning wasn’t over yet! Back at the 7.5km marker, Dennis and I turned away from the path and the rest of the climbers and headed towards the edge of the cliff. There we waited for my Via Ferrata guide, Mohammed Ali. Yes, that’s actually his name – his dad was a boxing fan, he told me. He went over the technique with me again – we’d been through it the previous afternoon too – and then we clipped ourselves to the side of the mountain, and leaned out over the edge. There is no better way to experience a mountain view than by hanging off the side of it. The weather changed constantly, fogging one moment, brilliant sunshine the next. We crossed suspension bridges, semi-abseiled, and scrambled through scrub. It was hard, but I loved every second. And Ali took some great pictures with my camera! Looking down to Laban Rata from the top of the Low’s Peak Circuit Via Ferrata! Oh, hey, yeah, just chilling out on the side of the mountain. The views you get from the Via Ferrata are totally different to the views you see climbing Mt Kinabalu. Hurry up and take the picture!! This is scary!! By the time I got back to Pendant Hut at around 10am, my legs were shaking badly. I felt like I might not be able to stand up much longer. But I couldn’t wipe the smile from my face. I relaxed for the rest of the day. I wrote some post cards, read a bit more, and just generally chilled out. I had a light dinner, just some salad and veggies, and went to bed very early. I was SO TIRED. Well, I’d been up since 2am and I hadn’t slept the night before at all! Unfortunately, I didn’t get to sleep much that night either. Within about two hours, I was awake and puking up everything I’d eaten that day. 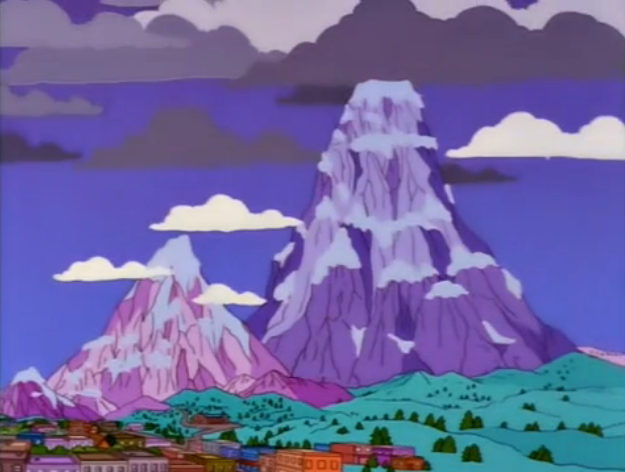 Food poisoning, exacerbated by the remnants of my mild altitude sickness. It’s probably the sickest I’ve ever been. I’ll spare you the details of course – I’m sure you don’t want to hear them – but I was becoming really worried I wouldn’t be able to walk down again. The guys at the hut took excellent care of me though. They were really lovely. The next morning, severely dehydrated and only barely able to keep a little water down, I was shaky but able to walk. I said goodbye to my plan to head down the more challenging Mesilau trail – by then it was far more important to just get to the bottom. Dennis shouldered my backpack for me and gave me a walking stick, and with frequent rest stops we headed off. Most people descend in about half the time it took them to climb to Laban Rata. It took me closer to twice as long! The last little uphill bit past the waterfall to the gate felt like a cruel joke. But I made it to the bottom again. And I didn’t have to get a helicopter or anything! Even though I had a bit of a rough time, climbing Mt Kinabalu was still one of the best things I’ve ever done. As promised, despite the cost, the exhaustion, and even the vomiting, it was absolutely worth it and I would do it again in a heartbeat. And maybe next time I’ll make it down Mesilau!